to be the same mob supporting "democracy icon," Aung San Suu Kyi. 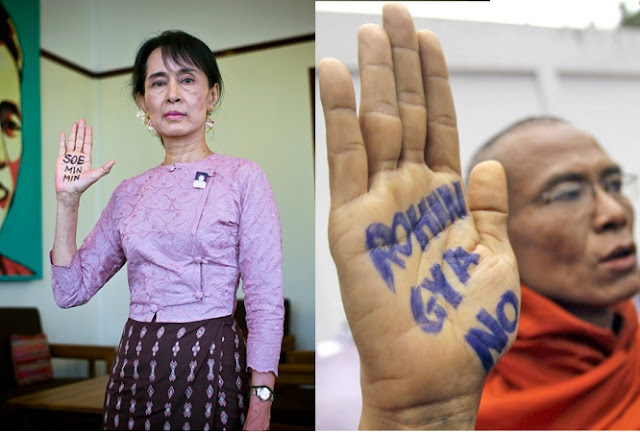 March 6, 2015 (Tony Cartalucci - NEO) - Not unlike other US-backed "color revolutions" around the world, Myanmar's "Saffron Revolution" is sold as an ultra-liberal pro-democracy, progressive movement, with one of the West's most successful neo-colonial creations to date, Aung San Suu Kyi, portrayed and revered as a modern day, secular "saint" of neo-liberalism and Western democratic values. Underneath the pageantry and spin, however, is harbored ultra-right racism, bigotry, misogyny, and unhinged violence that if ever truthfully reported on, would end the "Saffron" wave, and spell the absolute end of both Suu Kyi's political career and her legacy. Most recently Suu Kyi's "Saffron" movement took to the streets, not to call for greater "freedom" or to defend "human rights," but to condemn the government's move toward giving hundreds of thousands of stateless Rohingya refugees citizenship. Myanmar's government says identity cards for people without full citizenship, including Muslim Rohingya, will expire within weeks. Some might call it strange for a so-called "pro-democracy" movement to take to the streets to specifically deny hundreds of thousands their right to be represented. Indeed, the move was instead entirely driven by Suu Kyi's political bloc and its attempt to skew upcoming polls with a large, well oiled political machine built with decades of support and billions of dollars funneled in from the United States and the United Kingdom, the latter having had colonized Myanmar and who still refers to the nation as "Burma," its colonial nomenclature under British colonial rule. A Myanmar Buddhist monk who called a UN human rights envoy a "whore" has violated his monastic code and could damage his religion, another prominent monk says, but he is unlikely to face censure. 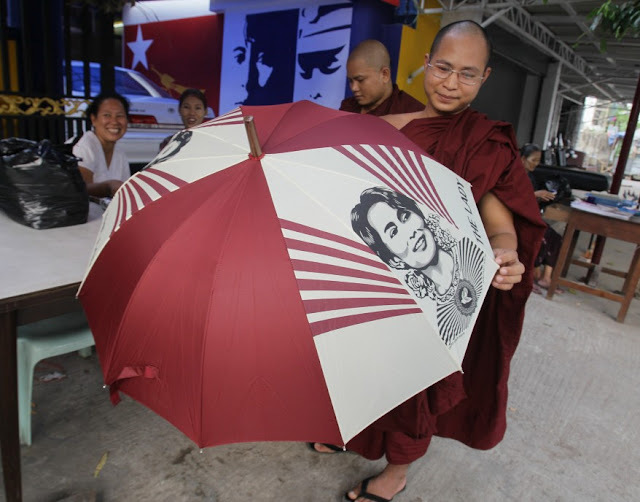 Wirathu, also known as the "Buddhist Bin Laden," led Aung San Suu Kyi's "Saffron Revolution" in 2007 and his followers regularly fill the ranks of street mobs organized in support of her political party, the National League for Democracy (NLD). Both Suu Kyi's NLD and her "Saffron" mobs, are fully funded, backed, protected by, and in absolute servile obedience to both US and British special interests. A 2006 36-page document out of the "Burma Campaign UK" explicitly details the enormous amount of money and resources both the US government and its corporate-funded foundations have poured into Suu Kyi's image and her "movement." The most telling information begins on page 14 of 36 of the report's PDF file. Titled, "Failing the People of Burma?" the report enumerates the vast resources the West has invested in building a "pro-democracy" movement, and argues that even more support be given to initiate a "transition" in Myanmar. NED is also cited as behind the creation of a vast propaganda network including the New Era Journal, the Irrawaddy, and the Democratic Voice of Burma (DVB) radio, all posing as "independent" media sources despite the fact they are in reality fully-funded by the US government. The United States helps fund Mizzima through its National Endowment for Democracy, one source of the generals' assertions that the protests are the result of outside agitation. Myint and a friend hit the headlines in 1990 when he hijacked a Thai International Airways plane to protest the junta's rejection of elections won by pro-democracy leader Aung San Suu Kyi's National League for Democracy. He used fake bombs made out of soap cases to hijack the plane flying from Bangkok to Yangon with 220 passengers on board. The two friends were released in 1991 after a three-month jail term and were recognised as refugees in India. The US State Department literally is funding a terrorist guilty of hijacking a civilian airliner, millions of US dollars in taxpayer money to undermine and overthrow the government of Myanmar - all under the guise of "democracy promotion." And believe it or not, the US State Department making a known terrorist head of a propaganda outfit carrying out foreign-backed subversion is relatively tame compared with Suu Kyi's "Saffron" street front. The abhorrent racism, bigotry, and violence exercised by Suu Kyi's "Saffron" mobs could best be compared to that of America's Ku Klux Klan or violent anti-Semitic pogroms seen in Europe, particularly during the rise of Nazism. Led by the above mentioned violent demagogue Ashin Wirathu, the mobs enforcing Suu Kyi's rising political order depend on constant and substantial cover provided by the Western media. Despite this cover, kernels of truth still make their way through the propaganda smokescreen. Buddhist monks and others armed with swords and machetes Friday stalked the streets of a city in central Myanmar, where sectarian violence that has left about 20 people dead has begun to spread to other areas, according to local officials. In the western state of Rakhine, tensions between the majority Buddhist community and the Rohingya, a stateless ethnic Muslim group, boiled over into clashes that killed scores of people and left tens of thousands of others living in makeshift camps last year. Most of the victims were Rohingya. Similar violence in September of 2012 revealed the name of one of the leading "monks." AFP's article, "Monks stage anti-Rohingya march in Myanmar, refers to the leader of these mobs as "a monk named Wirathu," referring of course to Ashin Wirathu himself. In March 2012, Wirathu had led a rally calling for the release of so-called "political prisoners," so designated by US State Department and its stable of faux-human rights NGOs. Wirathu himself was in prison, according to AFP, for inciting hatred against Muslims, until released as part of an amnesty, an amnesty US State Department-funded Democratic Voice of Burma claims concerned only "political prisoners." Image: Real monks don't do politics. 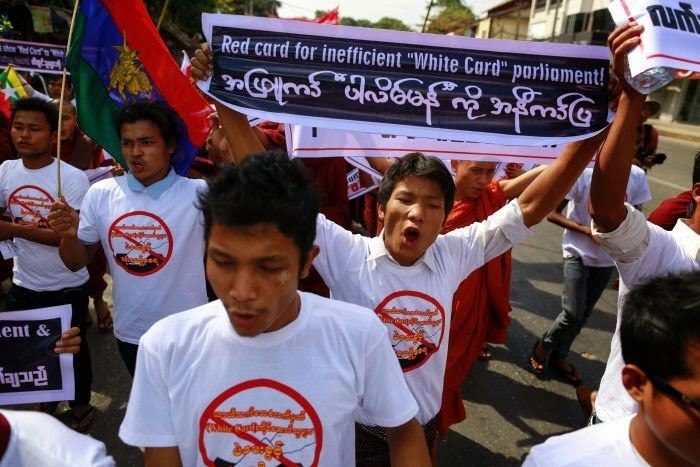 The "venerable" Wirathu (front, left) leads a rally for "political prisoners" loyal to Aung San Suu Kyi's "pro-democracy" movement in March, 2012. Wirathu himself has been often portrayed as an "activist monk" and a "political prisoner" who spent years in prison. In reality, he was arrested for his role in deadly sectarian violence in 2003, while Suu Kyi's "pro-democracy" front is actually US-funded sedition. Wirathua has picked up right where he left off in 2003, and is now leading anti-Rohingya rallies across the country and has most recently labelled a UN envoy a "whore" for defending the Rohingya minority against his and his followers' savagery. . While Western news agencies have attempted to spin more recent violence as a new phenomenon implicating Aung San Suu Kyi's political foot soldiers as genocidal bigots, in reality, the violent, sectarian nature of her support base has been back page news for years. AFP's more recent but uncharacteristically honest portrayal of Wirathu, with an attempt to conceal his identity and role in Aung San Suu Kyi's "Saffron" political machine, illustrates the quandary now faced by Western propagandists as the violence flares up again, this time in front of a better informed public. During 2007's "Saffron Revolution," these same so-called "monks" took to the streets in a series of bloody anti-government protests, in support of Aung San Suu Kyi and her Western-contrived political order. HRW would specifically enumerate support provided to Aung San Suu Kyi's movement by these organizations, including the Young Monks Union (Association), now leading violence and calls for ethnic cleansing across Myanmar. The UK Independent in their article, "Burma's monks call for Muslim community to be shunned," mentions the Young Monks Association by name as involved in distributing flyers, demanding people not to associate with ethnic Rohingya, and attempting to block humanitarian aid from reaching Rohingya camps. The equivalent of Ku Klux Klan racists demanding that America's black population be shipped back to Africa, the US State Department's "pro-democratic" protesters in Myanmar have been revealed as habitual, violent bigots with genocidal tendencies. Their recent violence also casts doubts on Western narratives portraying the 2007 "Saffron Revolution's" death toll as exclusively caused by government security operations. The shadow of controversial monk Wirathu, who has led numerous vocal campaigns against Muslims in Burma, looms large over the sectarian violence in Meikhtila. Wirathu played an active role in stirring tensions in a Rangoon suburb in February, by spreading unfounded rumours that a local school was being developed into a mosque, according to the Democratic voice of Burma. An angry mob of about 300 Buddhists assaulted the school and other local businesses in Rangoon. The monk, who describes himself as 'the Burmese Bin Laden' said that his militancy "is vital to counter aggressive expansion by Muslims". He was arrested in 2003 for distributing anti-Muslim leaflets and has often stirred controversy over his Islamophobic activities, which include a call for the Rhohingya and "kalar", a pejorative term for Muslims of South Asian descent, to be expelled from Myanmar. He has also been implicated in religious clashes in Mandalay, where a dozen people died, in several local reports. The article also cites the Burma Campaign UK, whose director is attempting to rework the West's narrative in Myanmar to protect their long-groomed proxy Suu Kyi, while disavowing the violence carried out by a movement they themselves have propped up, funded, and directed for many years. It would be bad enough if US "democracy promotion" had only caused such bloodshed and perpetual injustice in Myanmar alone, propelling the absolute worst elements of society into prominence, but unfortunately similar movements of violent, US-backed criminals have attempted to seize power in neighboring Thailand, led by billionaire mass murderer Thaksin Shinawatra, and around the world including in Libya, Syria, and most recently in Ukraine. If Aung San Suu Kyi, patron saint of US "democracy promotion," can be exposed and prevented from seizing power in Myanmar, Washington's other schemes around the world can also be overturned. And even with the monumental illusions constructed around Suu Kyi, both domestically and abroad, the veneer has begun to peel. Hiding her "Saffron" enforcers will become increasingly difficult, and with a fully mobilized alternative media, when the final push begins, the public will already be one step ahead of the professional liars who have already long-allowed this injustice to fester for decades.